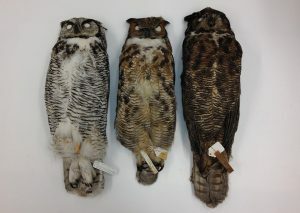 Photo: Great Horned Owls, from left to right: B. v. subarcticus, B. v. viginianus and B. v. heterocnemis. Canadian Museum of Nature collections. An FYI for Ottawa birders: that remarkable, pale Great Horned Owl to the left in the photo below was collected at Shirleys Bay in January 1975 by the late Richard Poulin.